As the number of pubs continue to decline, rural communities are fighting to keep their local pubs open. Such is their strength of spirit, residents are now creating unique hubs to flourish in the future. Marie Claire Kidd reports. The local pub is a focal hub for many rural communities across the UK. About 18 pubs close every week across the UK and rural pubs are not exempt. But such is their social lifeline, more communities are fighting to save what is a vital aspect of their neighbourhood. Residents are choosing to take action and consider community ownership as a way of taking control of their pub. No less than 60 British pubs are now community-owned. The latest addition is the Swan Inn in Banton, north Lanarkshire, where People United for Banton (PUB) have been awarded £738,149 to renovate their pub and create a community hub. PUB will get the keys in June and its project will increase the services available locally, tackle isolation and loneliness, boost economic development and make the area more attractive to tourists and locals alike. Secretary Catherine Moneypenny says the village had already lost its post office and shop. “Almost two years ago the people of Banton feared losing our only pub, one of our last amenities. Now we’re buying it,” she says. Community-run watering holes are nothing new, with working men’s clubs, sports and social clubs having existed as member-owned entities for decades. But, as James Alcock, executive director at the Plunkett Foundation explains, co-operative pubs are different. “They are owned by members and governed democratically,” he says. “Each member gets one vote and has a say about what is important to them. “Once in community control, they tend to be run by full-time managers or tenants with the support of members of the community who volunteer. Each co-operative pub is different. At the George and Dragon in Hudswell, North Yorkshire, part of the pub gardens have been turned into community allotments and part of the bar is now a shop. The chefs in the pub kitchen make almost everything on-site, including pies and bread, using local ingredients and as much beer or cider as possible. The pub is owned by 200 mainly local people, thanks to a £300,000 community share issue. Tafarn y Fic in Llithfaen, a small village on the Llŷn Peninsula, Gwynedd, has become a cultural and community centre for its area, and is famous for its Welsh music nights. The late Gwyn Plas was instrumental in establishing the co-op which runs the pub, and is remembered through the Gwyn Plas heritage trail, which starts at the pub. This is Britain’s first co-operative pub, and dates back to 1988. The Old Crown in Hesket Newmarket, in the Lake District National Park, is owned by 150 customers and supporters from the local and wider community. It is closely linked with the Hesket Newmarket Brewery, which was established by a former landlord and landlady and sits next door to the pub. As well as co-operative pubs, an even larger number of community pubs are thriving in our rural villages. These are privately run businesses which offer facilities or services which benefit their community. According to the Campaign for Real Ale, a community pub should be inclusive and appeal to all sectors of society. It might operate extended opening hours, so mums and tots or senior citizens’ groups can use it in the daytime. It might run events which encourage social interactions, such as quiz nights, or sponsor a local youth football team. It could organise tables and chairs in a communal arrangement to encourage social interactions, in contrast to a restaurant which typically organises tables to isolate groups of customers from each other. Many provide facilities otherwise lost, such as a village shop or post office. 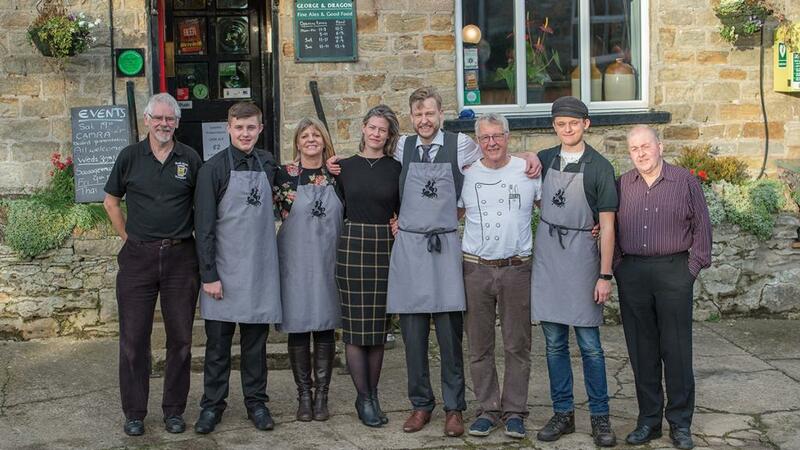 In the Lincolnshire village of Burton Coggles, landlords John and Lesley Berry have created a butchery and farm shop at the Cholmeley Arms, stocking fresh meat, bread, vegetables and dairy produce, as well as everyday essentials such as tea, coffee and cereals. Lincolnshire County Council provided a capital grant of £5,000 towards the project and the remainder was shared between John and Lesley and the Easton Estate. Supported by its local community, the Swan Inn, Enford, Wiltshire, won Best Rural Pub at the 2017 Countryside Alliance awards. The villagers had watched their local bakery, garage, post office and shop disappear, but were determined to keep their last remaining amenity. The building is now owned by a small group of villagers and run by landlords Emma and Pete Jeffries. Like many community pubs, the Swan Inn promotes local food, buying its pork, beef and venison from Enfod farmer James Waight and sourcing smoked trout, chicken and duck for salads and starters from Fjordling Smokehouses, Romsey. Countryside Alliance awards director Sarah Lee says the pub helped put the heart back into the village. She says: “When they took over the pub the village felt like it was split into two halves and was lacking community spirit. This husband and wife team have worked tirelessly to make a success of this new business, while one of them is a head teacher at two rural primary schools. The impact of co-operative and community pubs on their local area cannot be underestimated, says John Longden, chief executive of Pub is The Hub, a not-for-profit organisation which supports community pubs. He says: “Rural pubs which provide additional services for their communities make an immediate impact on those using them but they also create a ripple effect with regard to economic growth. From the farmer supplying additional locally-grown food to a new shop, taking on new part-time staff or more tourists or visitors coming into the area. The New Inn, Llanddewi Brefi, is a traditional pub which provides real ales, an open fire and a beer garden with views of the Brefi Valley. Yvonne Edwards has been licensee here for 25 years. Although business was doing well, she wanted to add another service for the community as she felt this would be advantageous for both the business and the community. An adviser from The Pub is The Hub visited Yvonne to discuss her ideas. Locally, there is no cinema or community meeting room space, so Yvonne felt these would make excellent additions to her pub. There was already an extension and Yvonne required a grant to help furnish it and put projectors in. She also wanted to upgrade the kitchen to allow a luncheon club for senior citizens. In November 2014, the pub extended the back room and installed a state-of-the-art sound and WiFi system with drop down screen and projector to create a community meeting room and cinema. The project cost £13,000 including a Ceredigion Micro Business Investment Fund Grant of £5,000. Since then the room has been used almost daily by groups such as the Women’s Institute, Young Farmers, artists, an embroidery guild, a dominoes club and a pudding club for the local parent-teacher association. It provides film nights and regular fundraising events, including cockerel and pig racing. The Women’s Institute was even able to live stream a broadcast from the Albert Hall for their centenary annual meeting. Having also set up a library and book exchange area for customers, the pub also sells local produce including jams, preserves and chutneys and hosts darts and football teams. To date, 1,250 pubs have been registered as assets of community value under community rights. Practical and financial help is available through More Than a Pub, a two-year, £3.85 million programme which supports community ownership of pubs in England. It is funded by the Ministry of Housing, Communities and Local Government, and the Power to Change Trust, led by the Plunkett Foundation and delivered in collaboration with Co-operative and Community Finance, the Key Fund, the Campaign for Real Ale, Co-operative and Mutual Solutions, the Pub is the Hub and Locality.